Search Engine Optimization (SEO) means not having to constantly pay for website traffic. You can hire a team of specialists to put your site on Page #1 of Google - for a very hefty fee, that is... Or you can do it yourself. Seriously? SEO on your own? Yes, you can! 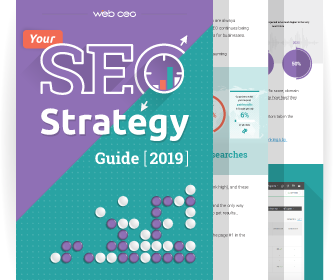 This SEO Strategy Guide for 2019 has got you covered. How to use your competitors' strengths against them, and many more! The guide comes with all the tools you need to get your SEO campaign started - and never stop until you reach the top. Register for a free 14-day trial of WebCEO and apply the tips from this Guide! Copyright 2001 - 2019 WEB CEO LLC.